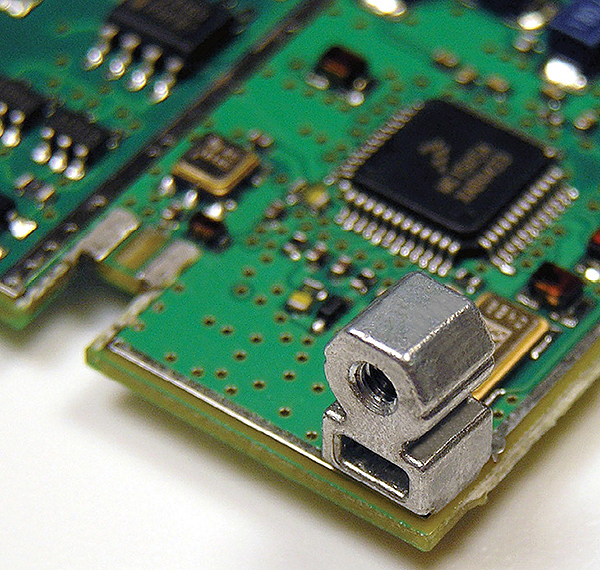 Surface mount fasteners have great importance on circuit boards and processes involved with circuit boards. When problems come up in manufacturing with stability, mounting, etc. of circuit boards solutions begin to be looked into by engineers. The result? They have come up with advancements in surface mount fasteners that you can learn about in the article below. Switching to surface mount spacers reduces hardware requirements and simplifies installation. Application challenge: One of Penn Engineerings manufacturing customers was constantly experiencing production delays for an application where printed circuit boards were mounted to daughter boards in a line card for optical fiber telecom equipment. Line cards are modular electronic circuits designed to fit on a separate printed circuit board and interface with a telecommunications access network. Board mounting was performed using four standard hexagonal pillars and eight sets of screws and washers to secure both boards. But high parts counts and related issues persistently slowed production, due to the tedious process of manually handling and installing the fasteners. There had to be a better way. Application solution: Designers specified four surface mount spacers to replace the pillars, screws and washers. The surface mount fasteners install onto printed circuit boards in the same way as other surface mount components and require no handling. As a result of the switch to surface mount hardware, the customer reduced total parts count by half and increased the production process by more than 50% thanks to the newfound installation expediency. Surface mount fastening technology has come a long way with more fastener types and functions. Regardless of type, surface mount fasteners will install permanently onto a printed circuit board using existing production infrastructure. By surface mounting a fastener to a board, designers can achieve significant cost savings without compromising the performance of a design. Fasteners fed on a tape and reel, assembled with pick-and-place equipment, and reflowed alongside other electronic components ultimately offer the potential to save handling time and money and reduce the possibility of board quality failures, which sometimes can occur as an offshoot of working with other kinds of hardware. When specifying hardware for printed circuit board applications, many designers may still find themselves turning either to loose fasteners or broaching fasteners. While both fastening families can provide the necessary functions, each carries potential risks that may impact the production process, the integrity of boards, and even whether disassembly can be performed should it be required. Loose hardware typically specified for boards includes spacers (plastic or metal columns to offset two boards), nuts and screws, which will usually require secondary installation-related operations performed manually. These secondary operations can consume considerable time, due to the painstaking work necessary to align all parts, often on both sides of a board. Then, with installation completed, another step must be taken to safeguard that no loose parts have gone missing in the assembly, since the errant parts could rattle oreven worsecause shorts or end-product failures. Disassembly can also be an issue, since the loose hardware needs to be contained. Broaching fasteners, such as spacers and nuts, remove the issues associated with handling loose hardware, but improper installation can place boards in jeopardy. These types are designed to broachinstalling permanentlyby pressing the fasteners knurled section into a slightly smaller mounting hole in the board, which forces the knurls to cut into the board. Installation usually will be performed after boards have been populated with electronic components. Unfortunately, if the broaching fastener installation process is performed improperly on a populated board, the board can be subjected to significant stress and likely ruin. Micro-cracks may form to sever traces in any of the boards multiple layers and boards ultimately may have to be scrapped, along with the pre-existing and pricey onboard components. Board damage can further develop if a broaching fastener is misaligned while being pressed into the mounting hole during installation. This can cause large-scale cracking or breaking of the board. Surface mount fastening technology removes all the risks and delivers production and quality rewards. The hardwaresupplied on tape and reel consistent with SMT automated installation equipmentis positioned where designed while the board is processed and then permanently installed with pick-and-place robotics in the same manner and at the same time as other surface mount components prior to the automated reflow solder process. The fasteners simply become another non-intrusive component on a board. And since the parts are packaged on a tape and reel (neither loose nor dumped into bowls), any chance of mixing the parts with other hardware disappears. The portfolio of surface mount fasteners is growing and many types and styles have been engineered, each serving one or multiple purposes. Depending on type, surface mount fasteners can be specified to mount, stack or space boards; attach components to boards; or create right-angle attachment points on boards. Some integrate captive screwseliminating loose screws and all the related hasslesideally suiting applications where removal and reinstallation of boards is anticipated.  Surface mount spacers, nuts and standoffs. These threaded or unthreaded types offer the capabilities to stack, space and attach and can be installed in boards as thin as 0.020 in. (0.5 mm). Reels carry up to 3,500 parts, depending on fastener size. A polyimide patch is supplied to allow reliable vacuum pickup. Fasteners are available either in brass or steel.  Surface mount captive panel screw assemblies. These fastener assemblies, available in several styles, can be installed in boards as thin as 0.063 in. (1.6 mm) and permit easy removal and reinstallation of boards. They can be provided as a two-piece assembly with a plastic cap or as a spring-loaded, all-metal fastener that is installed preassembled in one piece. The screws can be finger or tool actuated after installation.  Surface mount right-angle fasteners. These provide an efficient and reliable method to create permanent right-angle attachment points on printed circuit boards as thin as 0.040 in. (1 mm). They provide reusable threads parallel to a board to accommodate a component for mounting 90º to the board. They can serve as viable alternatives to conventional angle brackets or threaded right-angle blocks for attaching board to chassis, chassis to board, or component to board. The shape of right-angle types readily allows the part to be picked up by a pick-and-place machine without requiring a patch. The fastener is presented in the tape and reel with two small pins downward and the flat portion of the fasteners head exposed to the pneumatic finger. The two pins at the bottom act as two very small pilots, providing stability and locational accuracy during placement. In addition, a step along the bottom allows the solder fillet to be formed along this edge, even while the face of the fastener is flush against an edge of the board. The fasteners rectangular hole reduces the mass and promotes quicker heating to minimize heat draw away from surrounding components on the board. The rapid rise in attachment applications for compact consumer electronic assemblies has led to extremely small micro versions of surface mount fasteners for these jobs. It should be noted that micro fasteners are not simply scaled-down versions of their larger counterparts. Special engineering comes into play. As fasteners are downsized, issues relating to tight tolerances and performance values, among others, become magnified and special features engineered into the fastener often become both critical and essential. As an example of a special feature, micro versions of spacers, nuts and standoffs integrate a unique hex-shaped barrel by design to create a larger solder area for enhanced reliability in service. 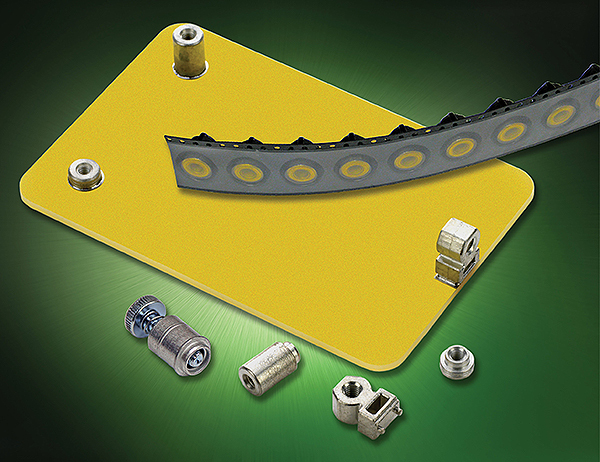 Variations have added even more function: Tin-plated brass versions offer superior electrical and mechanical attachment points for a board, in addition to fulfilling requirements for spacing, stacking, mounting and attaching components. Across the board, surface mount fastening technology can help to streamline production and promote reliable attachment of components, equipping designers with more options than ever before and benefiting applications immediately and down the line.